One of the inevitable consequences of a rapidly aging society is that people who die alone in their homes become more of a conspicuous phenomenon. There’s a word for it in Japanese–kodokushi–which is usually used when someone dies and no one discovers the body right away. As Japan became a more atomized society following the economic growth period of the 60s and 70s, more and more old people have been living in urban apartments by themselves, cut off from their communities and even from relatives. Isolated neighborhood groups often form patrols that keep an eye on elderly people living alone, checking up on them regularly to make sure they’re all right. One firm that works with UR, the nation’s public housing corporation, helps older tenants who find it difficult to move about. For ¥500 a month they take out their garbage for them, a service that doubles as a kind of patrol for obvious reasons. Most of these units available are older, less appealing places, for obvious reasons, but, for instance, a 2DK in Koto Ward in Tokyo, which would normally rent for ¥80,000 a month, is now available for ¥40,000 a month for at least a year. 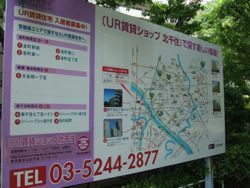 If you go further out to Machida, you can get a 2DK for as little as ¥30,450. Though you can find these units on the UR home page, you have to apply for them in person at a UR sales office.